Engineers have launched a huge garbage collection device to gather plastic material floating in the Pacific Ocean between California and Hawaii. The plastic makes up what is called the Great Pacific Garbage Patch. It is the world’s largest spread of garbage, at two times the size of the state of Texas. The organization Ocean Cleanup created the collection device. 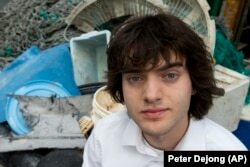 The group’s founder is Boyan Slat, a 24-year-old inventor from the Netherlands. Slat was just 16 years old when he was moved to clean up the oceans. He had been on a scuba dive in the Mediterranean Sea and saw more plastic bags than fish. The problem has only grown since. “The plastic is really persistent and it doesn’t go away by itself and the time to act is now,” Slat said. He told the Associated Press that researchers with his organization have found plastic from the 1960s and 1970s among the material in the Great Pacific Garbage Patch. It contains an estimated 1.8 trillion pieces of plastic in total. Most float on the surface of the water, or are within a few meters of the surface. Last Saturday, a ship pulling the pipe-shaped floating barrier left San Francisco for the Garbage Patch. The barrier, called the floater, is 600 meters across. Attached to it is a screening skirt that hangs three meters down in the water. The screen is designed to collect the plastic as it moves through the water. Sea animals can safely swim under the barrier. The cleanup system also comes with lights powered by the sun, cameras, and other special devices. Slat said this will make it so the system can communicate its position at all times. That way a support ship can find it every few months to remove the plastic it has collected. Shipping containers will hold all the plastic gathered, including bottles and fishing equipment. Slat said the containers are expected to be back on land within a year. Then the plastic will be recycled. Slat said he and his team will closely examine the system’s use of time and energy. They will also study how it performs in severe ocean conditions, including huge waves. “We still have to prove the technology,” he said. The Ocean Cleanup has received $35 million in donations to pay for the project, including from the heads of companies likeSalesforce.com and PayPal. The organization hopes to launch 60 free-floating barriers in the Pacific Ocean by 2020. Dutch inventor Boyan Slat stands next to a pile of plastic garbage prior to a 2017 press conference in Utrecht, Netherlands. The free-floating barriers are made to survive extreme weather conditions and damage from continual use. They will stay in the water for twenty years and in that time collect 90 percent of the garbage in the patch, Slat added. George Leonard is the chief scientist of the Ocean Conservancy, a nonprofit environmental activist group. He expressed concern about the cleaning project. He said even if plastic garbage can be taken out of the oceans, more continues to enter the water each year. Leonard said 8 million metric tons of plastic waste enter the ocean yearly. He said a solution to the problem must include preventing plastic from reaching the ocean. He said more education is need so people reduce the use of single use plastic containers and bottles. Leonard said his group will hold its yearly International Coastal Cleanup on September 15. About 1 million volunteers around the world will collect garbage from beaches and waterways. Last year, the Ocean Conservancy volunteers collected about 9,000 metric tons of plastic worldwide in about two hours, he said. Leonard also raised concerns that animals might be captured by the net that will hang below the surface. But, Boyan Slat said he does not think that will happen. The system will act as a “big boat that stands still in the water,” with nothing for sea creatures to get caught in, Slat said. But a boat carrying experienced marine biologists will also be launched to make sure the device is not harming wildlife. I’m Anna Matteo. And I'm Pete Musto. Olga R. Rodriguez reported this story for the Associated Press. Pete Musto adapted it for VOA Learning English. Caty Weaver was the editor. We want to hear from you. What effect do you think this system will have on the Pacific Ocean? Write to us in the Comments Section or on our Facebook page.